Nothing quite like using fresh squeezed grapefruit juice to make a margarita on a sunny day. Even better, the citrus was given to us from one of our neighbors. This entry was posted in Simple Sunday and tagged Drinks, Food, Grapefruit, Life, Neighbors, Simple sunday. Bookmark the permalink. Grapefruit margarita. Different. If you add a ton of sugar, I’m game. 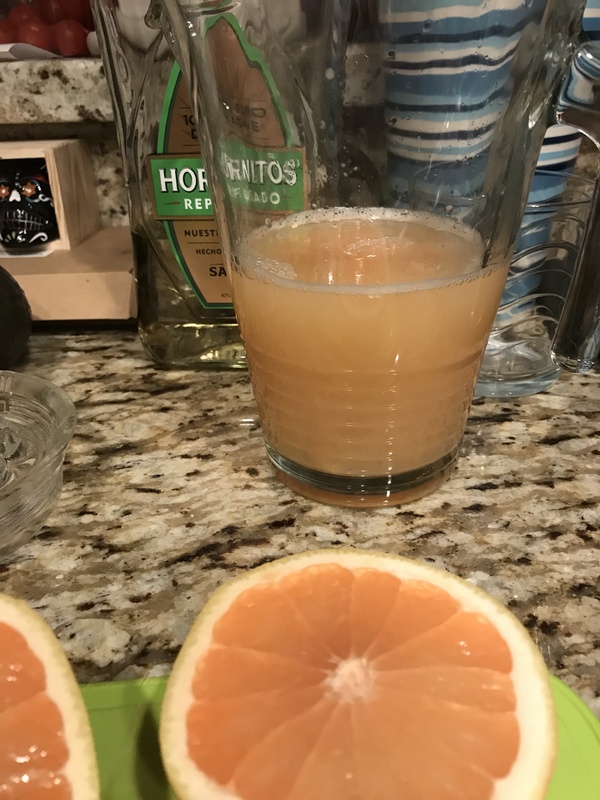 My husband’s recipe: 1/3 cup grapefruit juice, 2/3 cup Costco margarita mix (which is pretty sweet as it is and it has some alcohol in it already), and 1/3 cup tequila (I leave this out of my drink after trying it once – way too strong for me!). Pour over crushed ice. Sit out in the wonderful sun and enjoy. I actually drank some of that Costco margarita mix just on the rocks last night! My husband had finished off the homemade lemonade; otherwise, I would’ve added that. Still, quite tasty as is! Grapefruit margarita in the sun in January–wow! Remind me: why do I live in the Northwest?! You live in the Northwest for the beautiful summers and the amazing blues and greens that are lacking here in the desert. Nothing better than freshly squeezed citrus. Except when you add alcohol!